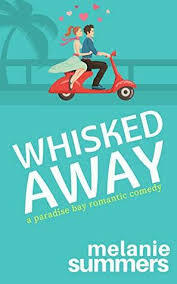 Synopsis (from Amazon): Watching her husband, Joe, regress from crossing the country on a bike to cheering him on as he navigated his wheelchair around the kitchen, CJ Golden had much to learn about caregiving. And she did - through her characteristic determination, quest for knowledge, boundless love and relentless optimism. 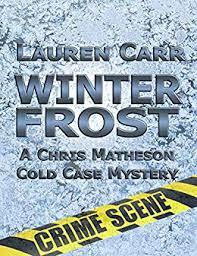 Within these pages the reader finds a balanced mix of somber reflections and light moments that highlight a very real passage in the lives of a husband and wife who love each other unequivocally. 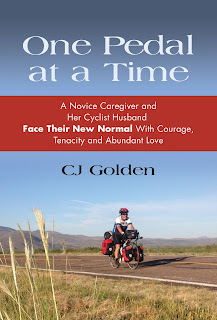 Golden shares the lessons she learned, the emotional and physical strain upon her heavily burdened shoulders, and the realization that, through it all, their connection and love have grown stronger. Joe’s motto for getting through life’s most trying times has always been, “one pedal at a time” - referring to his days traversing the country, for months at a time, on the two wheels of his road bike. Thus, the title of this book and, hopefully, a philosophy that will help carry others through their own caregiving struggles. One Pedal at a Time speaks to caregivers who need a place to turn to for information, inspiration and hope. And who enjoy a good love story. Their first ever hospital visit and the two little boys, ages five and eight, were ushered into Boopah’s room to view him lying in bed: barely able to walk or speak after suffering a series of strokes. This was much like my own paranoia when the three older grandchildren had come to be with me two years earlier, after back surgery rendered me unable to move my left foot. I was thus required to sport a bulky brace around that leg and had to use a walker in order to ambulate. Before they arrived, I’d made sure my makeup was on, my hair coiffed perfectly with a multi-colored ribbon hanging from the top to show them my body had changed, but my outrageous sense of humor was still strongly intact. I don’t know if it was the ribbon, or the fact that the inner me had not been altered by the physical alteration but I was, indeed, still Grams and was accepted as such. And now my concern went to my husband, Joe, and his future relationship with the kids. What is it about me that stubbornly holds on to unnecessary angst? Why could I not have retained the lesson I learned when I had been laid up? The kids knew who I was. They didn’t flinch. Of course, they cared and hoped I’d heal, but as far as they were concerned, I had not changed. Grams was, well, Grams. So, too, was Joe going to remain Boopah, for, while his body was temporarily out of service, his quick mind, easy laugh and abundant love for his family would never change. Once home, we had installed a system of ramps which allowed Joe’s wheelchair to be navigated from level to level. But before he was able to sit in that wheelchair, he’d needed a giant forklift-type of equipment to move him from his bed to the wheelchair. And the help of two able-bodied adults. The kids loved to help lift Boopah from his bed and place him in the chair. And they most certainly got a great kick out of having themselves moved by that lift into chair when it was unoccupied. Once in the wheelchair, they equated the adventure to something akin to a Disney ride. For his part, Joe enjoyed having the kids push him around the house and participate in his physical improvement. There were times, however, the house appeared to be too quiet to have the kids visiting. Where was the tumult that was part of enjoying grandchildren? That’s when we knew to listen for suppressed giggles and find them hiding under the ramps. Fast-forward a year and Boopah is now fully back; having regained his physical abilities. The forklift is no longer needed, nor the wheelchair or the ramps. There is, however, a large inflated cushion on his seat at the kitchen table. And, of course, the kids get a great kick out of sitting upon it. Recently Joe was in the kitchen while I was complaining about having to take out the garbage and recycling because he was not doing his part of the chores. His immediate response was, “I had a stroke, you know” followed by a huge, knowing smile. And then he grabbed the garbage bag from me and hauled it out into the garage. The thing is, instead of having worried about the children not accepting Grams or Boopah after our illnesses, I should have been thinking about all the ways in which they could participate in our recoveries. CJ Golden is a writer and motivational speaker from Newtown, Connecticut. Through her first two books, "Tao of the Defiant Woman" and "Tao-Girls Rule! ", she has been able to indulge in her passion for helping people, sharing her wisdom with women and girls. 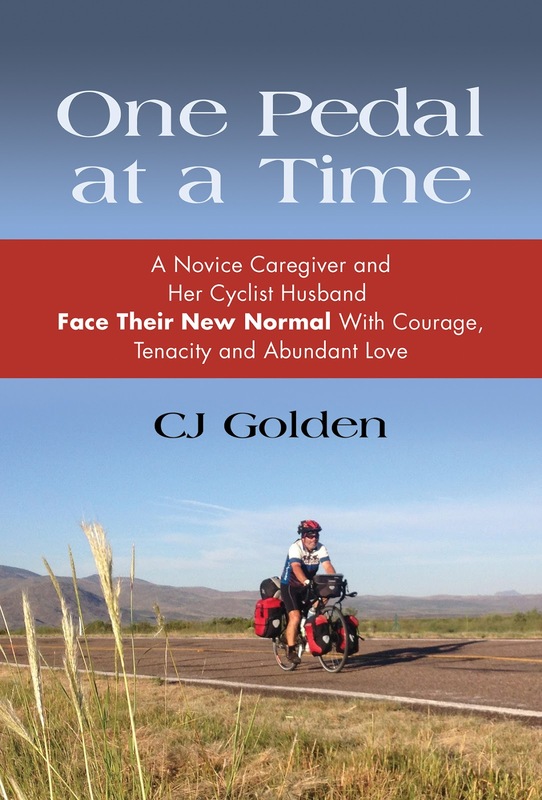 Golden’s latest writing remains focused on her new life as caregiver to her husband, Joe. Paramount are the lessons she has learned, the emotional and physical strain upon her heavily-burdened shoulders, and the realization that, while their roles as husband and wife have been altered, their connection and love have grown stronger. She has been fortunate to have to reached thousands of followers while blogging about her experiences as Joe’s caregiver. When numerous readers requested Golden turn her writings into a book. Those blogs gave birth to One Pedal at a Time: A Novice Caregiver and Her Cyclist Husband Face Their New Normal With Courage, Tenacity and Abundant Love.